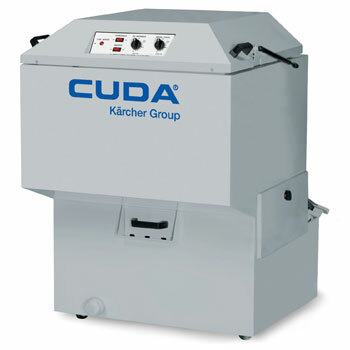 Cuda top-load parts washers are compact and ideal for small to medium sized parts. Our top-load aqueous parts washers range from 16 – 24 inch turntable diameters and 250 to 500 lbs load capacity. All models are certified to UL safety standards. 2412 Series - a 115V, entry-level top-load aqueous parts washer with a 24 inch turntable diameter and an upper drive arm that rotates the turntable. This series of parts washer offers a ½ HP mechanical seal with flush tube style pump producing 20 GPM at 22 PSI, low water shut down, an automatic oil skimmer, casters and is only 35 inches wide with a 250 lbs. load capacity. 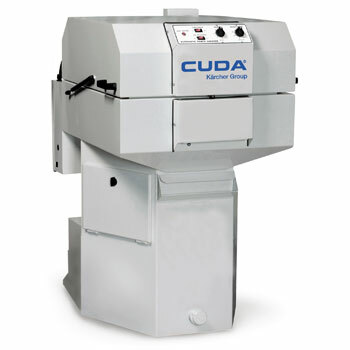 The 2412 Series models are certified to UL and CSA safety standards. 2216 Series - at only 32" wide and a 16" work height, this compact top-load automatic parts washer fits most commercial applications. The 2216 aqueous parts washers offer a 500 lbs load capacity, 23 gallon sump capacity, and feature low water shutdown, automatic oil skimmer and a 1 HP mechanical seal with flush tube style pump delivering 28 GPM at 30 PSI. All models are certified to UL safety standards. SJ Series - clean parts from every angle with this aqueous parts washer's patented spray wash technology – a water-propelled spray arm with 23 nozzles that spin around a stationary parts basket. This technology eliminates the need for a drive motor, gears and pulleys. The SJ models offer a 350 lbs load capacity, 90 gallon sump capacity and a 3 HP pump motor producing 37 GPM at 30 PSI. All SJ parts washers are certified to UL safety standards. 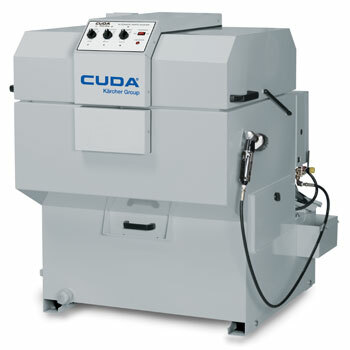 2518 Series - extra easy and automated throughout, the 2518 series top-load parts washer offers a virtually maintenance-free vertical seal-less 3 HP pump delivering 50 GPM at 45 PSI, and a disc oil skimmer that can be automated for disposing of oil. 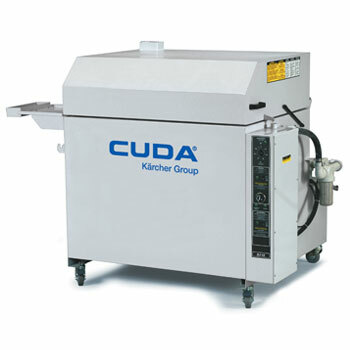 This aqueous parts washer comes standard with a time-tested chain drive assembly, easy access to the sump and a removable debris screen, low water shutdown, and they offer a 500 lbs load capacity. All models are certified to UL safety standards.